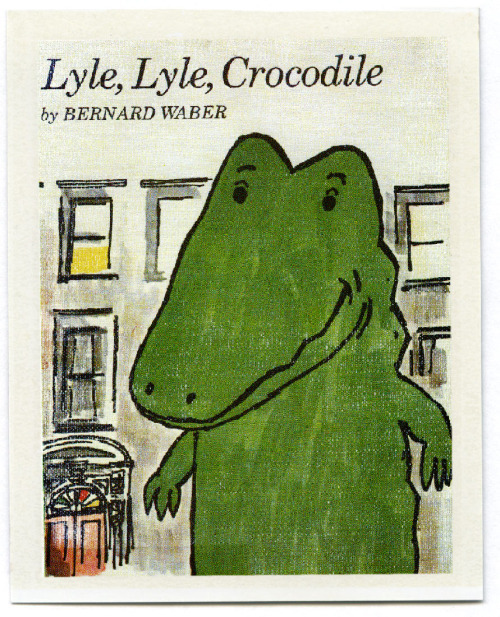 Fruitless Pursuits: RIP Bernard Waber, Author of Lyle, Lyle Crocodile. RIP Bernard Waber, Author of Lyle, Lyle Crocodile. I don't talk much about my real world existence here on a whole, but I've essentially spent 8 of my last 10 years of professional life with children's books. While I mostly read young adult books these days, I still have a soft spot for picture books, and one of my favorites as a child was Lyle, Lyle, Crocodile, about (spoiler alert!) a crocodile named Lyle who goes on adventures in the big city. It became a series of a number of titles for the author, Bernard Waber, who became famous for these books. Bernard Waber passed away last week at age 88. Every so often, there's a person who you encounter for a fleeting moment, and succeeds in making a lifelong impact. Bernard Waber was that person for me, so allow me a fleeting indulgence to tell a bit of a personal story about Waber. While in college, I worked in the children's area of a local independent bookstore. I learned that Waber was coming in to do an author event one evening, and of course I was excited, because I loved that book. Just loved it. Unfortunately for us, it was a snowy night, the weather wasn't great, and so turnout was probably going to be less than expected. At this point, though, I'm no older than 22, and I'm just excited that I'm meeting an author. We probably got fewer than 30 people to the event. Then this older gentleman walks over with his publicist, introduces himself to me and my coworker at the time, and we get rolling. At this point, he's no younger than 76 or 77, Lyle is well over 40 years old, likely sold millions of copies, a television show, and here is literally the most humble man I have ever seen. We had little Lyle puppets that he played with, and he was absolutely amazed that anyone would care enough to make a doll out of one of his characters, never mind that he could hold it in his hands and that kids were playing with it. He must have spoke for 45 minutes, signed some books, spoke to every person in the room there for him, and seemed genuinely touched by every person who came up to him and asked for a moment. The part that got me, though, was afterwards. I bought a book and had him sign it, of course, but then he started talking to me and my coworker. Probably about 10 or 15 minutes about our lives (I was still in college trying to figure life out, my coworker was (and still might be) a professional storyteller), just genuinely interested in the two people who hung out in the back while he did his thing. He then asked us for some book recommendations for his flight back home, which is a daunting prospect when you're basically making minimum wage and are responsible for a famous author's in-flight entertainment. I gave him Jerry Spinelli's Stargirl, he went on his way, and that chance encounter has stuck with me ever since. There's a lot of value in humility and following your dreams in spite of what other people might say. I'm not a success in those regards all of the time, but in the times I do falter in at least considering it, it's Bernard Waber's voice that tends to ring loudly in my ears. I never heard back from him regarding the book I left him with, and why should I have? He met thousands of people like me over his 88 years, and I doubt I left more than a residual impact on his life. I did get to see, however, how genuinely appreciative he was of people who shared their stories with him, and I'd like to think he'd be just as appreciative of the impact he's had on my life were I ever able to meet him again. We lost a great one this week.